Peter Paul Rubens confessed that “my talent is such that no undertaking in size, or how varied in subject, has ever exceeded my confidence and courage.” His monumental works exalting the Church and royal families of Europe are among the grandest accomplishments of the seventeenth century. As part of his preparatory process, it was Rubens’s practice to make oil sketches for his compositions. With their inspired brushwork and fluid execution, the Flemish master’s sketches have long been collected and acclaimed among the supreme masterpieces of this genre––not least for the process of creative genius that they reveal on such an intimate scale. The Martyrdom of Saint Ursula and the Eleven Thousand Maidens is an oil sketch for an unidentified altarpiece. The legend of Saint Ursula recounts how the virtuous daughter of a British Christian king, having reached Cologne on her return from a pilgrimage to Rome, was slaughtered by Huns along with her entourage of eleven thousand companions. 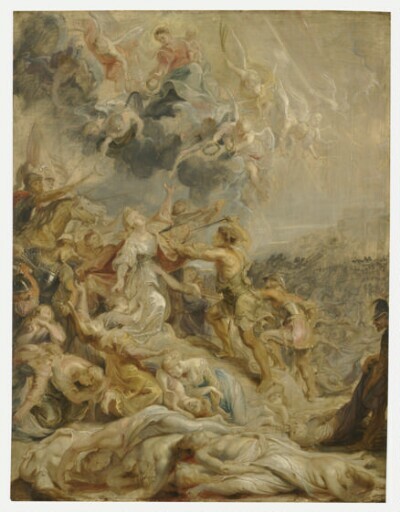 Rubens orchestrates the throng of figures––maidens, soldiers, and angels––into a series of thrusting diagonals bridging heaven and earth. At the calm center of this maelstrom is Saint Ursula, portrayed as a princess with her tiara and pearl necklace. She stands on the brink of martyrdom, as her tormenters prepare to impale her with spear and sword. Above, a flight of angels dispenses wreaths and palms as Ursula prepares to be united with the Madonna and Child in heaven. purchased through (E. V. Thaw & Company, Inc., New York) by Kimbell Art Foundation, Fort Worth, 1986.